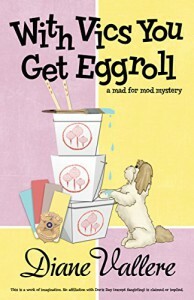 With Vics You Get Eggroll continues the fun and the good quality of writing that I've enjoyed in the first two books of this series. It also gives us growth and development of the characters. That's a pretty good thing in the world of today's cozy mysteries. It's a win with me. Madison Night, the ultimate Doris Day fan and mid-century modern designer, barely has time to recover from her last detective adventure when women start being abducted in the Dallas area someone is try to implicate her friend and potential love interest, Detective Tex Allen in the crimes. Tex takes a leave of absence from the police so that he won't hinder the investigation but, of course he is determined to find the killer and, of course, Madison is determined to help him. She's also in the middle of a job, restoring a Cliff May home to its original mid-century appearance. I'm a huge fan of mid-century modern so I looked up Cliff May homes on google and wow! They are gorgeous! And probably much easier to heat than my big ol' Victorian. Anyway, because cozies are nothing without coincidence, Madison's client becomes a victim of the kidnapper. It has a satisfying ending with plenty of clues along the way. I figured it out the same time Madison did. The love triangle gets settled and that can only be a good thing! I think the characters in this series are really solid compared to some of the fluffier cozy series out there. They don't feel cardboard, they feel flesh and blood. Madison has a lot of introspection in this book and a lot of character growth. That the author manages to do that in a fun mystery is fairly rare. I always want to go find a Doris Day movie as soon as I finish a book in this series. As long as the author keeps writing them, I'll keep reading them. Book provided by Netgalley in exchange for an honest review.